I have seen Forged in Fire where contestants are given a random piece of metal and are expected to forge a knife out of it. Knife is tested, winners go on to further forging test, etc.. Interesting and sometimes amazing how they forge metal like that. But there have been several guys on the show that are shown holding stock on a drill press in one hand and feeding a drill bit down into it with the other hand. For drilling a wooden handle. Terrible safety situation. I always want things held down with a vise or clamp or something before the drill bit comes down, never holding with a hand. I watched an episode the other night where one of the contestants was holding the blade, drilling a hole....ummmm, o.k. He then proceeded to pull on the blade while the drill was still in the hole to make a slot. Genius! By the way, there's a nice shiny JET mill just sitting there not 20 feet from him. Some pretty hanky s-<t happens on that show. I find myself gritting my teeth often while watching. My personal maximum is a 3/16" inch drill. Anything other than that and it either gets clamped or placed against the column (think sheet metal) to prevent it from rotating, while I hold it down with the "other" hand. The first rule of using t-slots is having t-slots on your machine. If not, other quick tooling like c-clamps can do the same job. Here's something simple you may want to make. I made these stops to use on my drillpress. They are just T-nuts with a stud and a drilled and tapped shaft. They have a cross drilled hole to tighten them with the chuck key handle. Just so your vise or workpiece isn't caught and spun out of your hand. Since we all have a habit of drilling stuff without bolting it down. I have a vise with X-Y movement mounted on my drill press. That has been useful for everything. Clamp down and have ability to fine tune the drilling spot. I use bike seatpost clamps bolts to hold my vise. It's much faster to use. Float lock vises will save your hands but are tuff on the wallet paper. If your lucky enough to find one under $100. Grab it if under fifty grab me one too. From my personal experience (I was on the show, season 3 episode 12, the Zweihander) the Safety team on site goes through a THOROUGH walk of all tool uses and safety rules. Contestants sign a form stating that they have been shown all relevant safety information and consider themselves competent to use the equipment correctly. 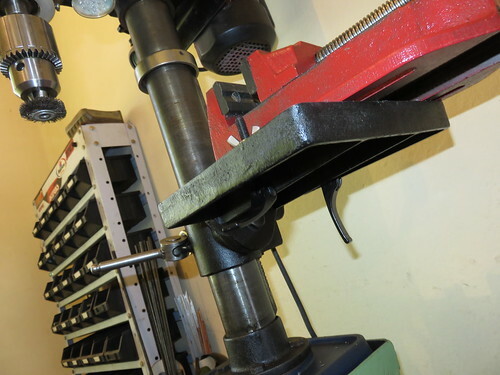 I have hand held many things in small belt driven drill presses, and still have all my body parts; if the job looks unsafe hand held, I use the vise grip welding clamps with the big U jaws; I always use T slot clamps on gear driven drilling machines. Some of the safety violations on that show are scary stupid. Each episode seems to feature one clutz . There is always at least one who has never used one of the power tools before. I just presumed that ignorance was part of the formula of the show. Can I imagine, that perhaps, some of this may be scripted????? I can't speak for the show at large, the episode I was in had absolutely zero scripting or even prompting from the producers. I'm certain with more introverted contestants they do a bit more "guidance" to try and get them out of their shell. But no first hand knowledge. I think we're all guilty of 'cheating' from time to time. I try to weigh the risks vs. the advantages before placing bodily parts in harms way. Like if a small wooden grip needs a hole poked in it, the chances of a serious injury are very low. But the 1/4" piece of steel needing a half inch hole will definitely get clamped down. As for the show, I was watching the other night and a guy caught his finger between the press column and the work piece. It got him badly enough that he needed the med team to check it out. A band aid solved the problem, but it could have been much worse. Speaking if the show; last week I flipped it own and heard a familiar voice... It was my cousin, right there on national TV. And tonight another forum buddy will be on at 9 PM. I'll be watching again. And I'll look for reruns of season 3 episode 12 for another forum buddy. The show would be better if they given more time to guys work in his knives. Would be nice if the show had an episode where the expert judges were the contestants to see what they can do. You would think that the smith's would have a couple end mills in their bag. Funny to see them try to make a slot with drill bit and not clamping it either. The smiths are only allowed 3 personal tools which an end mill would count. no reason for not clamping, that's just a bit silly. Not heard the 3 tool limit, makes sense thou. Thanks for the info. Watched a couple episodes of that show recently and was surprised by how interesting it was. This year I added an 8" Wilton drill press vise (>50 lbs!) after spinning a sheet metal part that was too large for my 4" vise. No harm done, as I was prepared for that possibility. But it was a good excuse to buy the vise I've needed many times before. I love those Wilton vices. Still want one but other tools higher on the want list. The show should be an embarrassment to any competent workman. I'm reminded of the old saying "You don't know what you don't know". Or in this case 'You don't see what you don't see'. I know personally two competitors from the show and I understand a lot of editing goes into making the show. I'm sure what we see on the air is a very condensed version of what transpires during filming. Point being that the show is there for ratings and drama creates interest. So, I'm not going to judge based on what's shown on air. Plus, I don't know how I would react to being in front of the cameras, timed, and critiqued on national television. I think those guys do a great job. I will say I love the show and am guilty of saying aloud 'WTH was he thinking' or 'don't do it'. Compared to other options on TV it is worth watching. They do always edit so the most cocky and confident guy loses. Probably have them all say bragodocious things then edit in the guy who gets cut later. Like every reality type shows, each episode needs to be better then the last. Not that they are looking for someone to get hurt, but I bet the producers would love to see a drill press take a knife blade for a spin. That, along with the arse chewing, and having the contestant thrown off the show for a safety violation, could be a high lite for the episode. If your on the show, any screw up will make the final tape. Recall the one where the firemen showed up at the home forge. They neighbors were used to him, I figured the producer might have called in for show highlight. They edit in sound bites as well to make judges look smarter. Nothing is off limits for ratings. I like the show, but you just have to watch it for what it is. Would be great to see same show setup with CNC machining or manual machining challenges. Really skilled guys show up and have to make things with random material, time limits, etc..
Maybe a show by "Skills USA" who does competitive skills competitions around the world. It works with High School age kids to find the best of them. USA gets beat bad sometimes by countries that have kids break off early High School age and into apprentices and have lot of real world experience to compete with at that age. Good idea, perhaps has teams of mentor and student. Remember Junkyard Wars, not super popular, but I sure liked it. It ran a couple season I think. The Car and Bike build shows seem to top of list.